THERE IS A shellfish crisis in west Cork and Kerry, resulting in some of Ireland’s top quality mussels being unfit to eat. Some bays have been forced to close down for five consecutive months, said the Irish Shellfish Association. Many farmers have had to watch their crops wash away during the winter storms instead of fetching premiums in top supermarkets and restaurants. Producers from Castlemaine to Dunmanus Bay have been impacted, largely as a result of highly unusual algal blooms this winter. 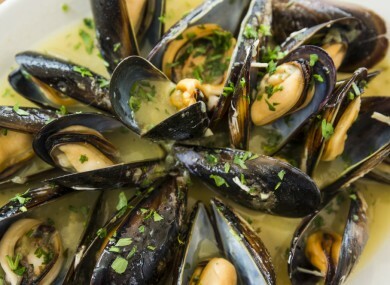 The Irish Farmer’s Association’s (IFA) analysis shows that up to 10,000 tonnes of top quality mussel crop has been lost to the elements or is now unusable. Richie Flynn, IFA’s Aquaculture Executive said the crop should have been sold in November, December and even January. Some bays have been closed continuously since mid-2014 due to the extremely rare occurrence where algal blooms, which should have disappeared, stayed within the bays making the shellfish unsafe to consume. Even if the bays were opened in the morning, prices have entered the annual cyclical slump and most of the crop has lost its quality appearance and size as it prepares for the spring spawning season. By closing their harvesting operations, the mussel farmers have ensured consumers are safe, but the IFA said they have no control over the length of time these natural blooms can persist in the ocean. Producers are not arguing with the science or criteria which closed them down, but the IFA said many of these farmers have been out of business for many months. Under EU rules, which recognise it can be extremely painful for producers, a special scheme to allow producers to stay in business was set up. The IFA says the official recognition was enshrined in EU regulations over seven years ago. It urged Minister Coveney to use these EU rules now to find a scheme to help dozens of small family businesses along the south west coast to stay in business. This is the Minister’s chance to make a real difference and keep open as successful indigenous industry in an important economic black-spot. Email “Bad news if you love mussels: 10,000 tonnes of top quality Irish shellfish is unfit to eat”. Feedback on “Bad news if you love mussels: 10,000 tonnes of top quality Irish shellfish is unfit to eat”.